Table 1-1 describes the buttons on the Cisco IP Phones 7906G and 7911G. Displays phone features such as phone number, call status, and softkeys. 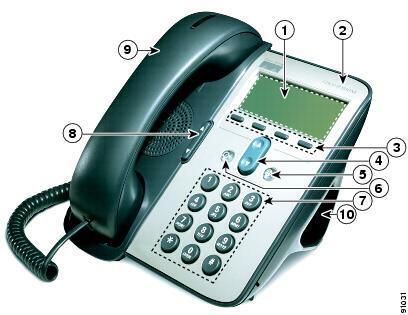 Indicates your Cisco Unified IP Phone model series. Allows you to scroll through menu items and highlight items. When the phone is on-hook, displays your Speed Dials. Displays the Applications menu that provides access to a voice messaging system, phone logs and directories, settings, and services. Places the active call on hold, resumes a call on hold, and switches between an active call and a call on hold. Allows you to dial phone numbers, enter letters, and choose menu items. Controls the handset, headset, speaker, and ringer volume. Functions like a traditional handset. The light strip at the top of the handset blinks when the phone rings and stays lit if there is a new voice message (depending on your voice messaging system). Allows the phone to stand at a convenient angle on a desk or table. Also may be removed for wall mounting to mounting screws or to a Cisco Unified IP Phone wall mount kit. What Networking Protocols Are Used? Cisco Unified IP Phones support several industry-standard and Cisco networking protocols required for voice communication. Table 1-2 provides an overview of the supported networking protocols on the Cisco Unified IP Phones 7906G and 7911G. BootP enables a network device such as the Cisco Unified IP Phone to discover certain startup information, such as its IP address. If you are using BootP to assign IP addresses to the Cisco Unified IP Phone, the BOOTP Server option shows "Yes" in the network configuration settings on the phone. CDP is a device-discovery protocol that runs on all Cisco-manufactured equipment. Using CDP, a device can advertise its existence to other devices and receive information about other devices in the network. CPPDP is a Cisco proprietary protocol used to form a peer-to-peer hierarchy of devices. CPPDP is also used to copy firmware or other files from peer devices to neighboring devices. CPPDP is used by the Peer Firmware Sharing feature. DHCP dynamically allocates and assigns an IP address to network devices. DHCP enables you to connect an IP phone into the network and have the phone become operational without your needing to manually assign an IP address or to configure additional network parameters. DHCP is enabled by default. If disabled, you must manually configure the IP address, subnet mask, gateway, and a TFTP server on each phone locally. Cisco recommends that you use DHCP custom option 150. With this method, you configure the TFTP server IP address as the option value. For additional information about DHCP configurations, refer to the "Dynamic Host Configuration Protocol" chapter and the "Cisco TFTP" chapter in the Cisco Unified Communications Manager System Guide. HTTP is the standard way of transferring information and moving documents across the Internet and the World Wide Web. The Cisco Unified IP Phones use HTTP for the XML services and for troubleshooting purposes. The IEEE 802.1X standard defines a client-server-based access control and authentication protocol that restricts unauthorized clients from connecting to a LAN through publicly accessible ports. Until the client is authenticated, 802.1X access control allows only Extensible Authentication Protocol over LAN (EAPOL) traffic through the port to which the client is connected. After authentication is successful, normal traffic can pass through the port. The Cisco Unified IP Phone implements the IEEE 802.1X standard by providing support for the following authentication methods: EAP-FAST, EAP-TLS, and EAP-MD5. When 802.1X authentication is enabled on the phone, you should disable the PC port and voice VLAN. See the "Supporting 802.1X Authentication on Cisco Unified IP Phones" section for additional information. IP is a messaging protocol that addresses and sends packets across the network. To communicate using IP, network devices must have an assigned IP address, subnet, and gateway. IP addresses, subnets, and gateways identifications are automatically assigned if you are using the Cisco Unified IP Phone with Dynamic Host Configuration Protocol (DHCP). If you are not using DHCP, you must manually assign these properties to each phone locally. The Cisco Unified IP Phone supports concurrent IPv4 and IPv6 addresses. Configure the IP addressing mode (IPv4 only, IPv6 only, and both IPv4 and IPv6) in Cisco Unified Communications Manager Administration. For more information, refer to the "Internet Protocol Version 6 (IPv6)" chapter in the Cisco Unified Communications Manager Features and Services Guide. LLDP is a standardized network discovery protocol (similar to CDP) that is supported on some Cisco and third-party devices. The Cisco Unified IP Phone supports LLDP on the PC port. LLDP-MED is an extension of the LLDP standard developed for voice products. RTP is a standard protocol for transporting real-time data, such as interactive voice and video, over data networks. Cisco Unified IP Phones use the RTP protocol to send and receive real-time voice traffic from other phones and gateways. RTCP works with RTP to provide QoS data (such as jitter, latency, and round trip delay) on RTP streams. RTCP is disabled by default, but you can enable it on a per phone basis by using Cisco Unified Communications Manager. For more information, see the "Network Configuration" section. SRTP is available in addition to RTP. SRTP adds security by encrypting media streams during data transport. For SRTP to work, the phone or phones being called must also support SRTP or else those phones cannot decrypt the secure media stream. SIP is the Internet Engineering Task Force (IETF) standard for multimedia conferencing over IP. SIP is an ASCII-based application-layer control protocol (defined in RFC 3261) that can be used to establish, maintain, and terminate calls between two or more endpoints. Like other VoIP protocols, SIP is designed to address the functions of signaling and session management within a packet telephony network. Signaling allows call information to be carried across network boundaries. Session management provides the ability to control the attributes of an end-to-end call. You can configure the Cisco Unified IP Phone to use either SIP or Skinny Client Control Protocol (SCCP). Cisco Unified IP Phones do not support the SIP protocol when the phones are operating in IPv6 address mode. SCCP includes a messaging set that allows communications between call control servers and endpoint clients such as IP Phones. SCCP is proprietary to Cisco Systems. Cisco Unified IP Phones use SCCP for call control. You can configure the Cisco Unified IP Phone to use either SCCP or Session Initiation Protocol (SIP). SDP is the portion of the SIP protocol that determines which parameters are available during a connection between two endpoints. Conferences are established by using only the SDP capabilities that are supported by all endpoints in the conference. SDP capabilities, such as codec types, DTMF detection, and comfort noise, are normally configured on a global basis by Cisco Unified Communications Manager or Media Gateway in operation. Some SIP endpoints may allow these parameters to be configured on the endpoint itself. TCP is a connection-oriented transport protocol. Cisco Unified IP Phones use TCP to connect to Cisco Unified Communications Manager and to access XML services. TLS is a standard protocol for securing and authenticating communications. When security is implemented, Cisco Unified IP Phones use the TLS protocol when securely registering with Cisco Unified Communications Manager. For more information, refer to the Cisco Unified Communications Manager Security Guide. TFTP allows you to transfer files over the network. On the Cisco Unified IP Phone, TFTP enables you to obtain a configuration file specific to the phone type. TFTP requires a TFTP server in your network, which can be automatically identified from the DHCP server. If more than one TFTP server is running in your network, you must manually assign a TFTP server to each phone locally. For more information, refer to the "Cisco TFTP" chapter in the Cisco Unified Communications Manager System Guide. UDP is a connectionless messaging protocol for delivery of data packets. Cisco Unified IP Phones receive and process UDP messages.